Event hosted in May by the Preservation Foundation, provided the public with a rare opportunity to indulge their curiosity. Elle Décor? Sunday drives down dreamy lanes? MTV’s Cribs on Snapchat? We all like to look at other people’s homes; we are all curious about how people live. According to scientists, this peeking between the hedges isn’t only acquisitiveness. When we study objects used to shelter, nourish and aesthetically please other humans, we learn more about our own nature and desires. The Historic Homes Tour, hosted in May by the Saratoga Springs Preservation Foundation, provided the public with a rare opportunity to indulge their curiosity. The May 13 tour offered a look at the interiors of grand homes and a glimpse into the city’s history. Honorary co-chairs were Tamie Ehinger and Alex Willard. As a kick-off fundraiser for the Foundation, Ehinger and Willard hosted Porch Parties at their respective homes at 688 North Broadway and 718 North Broadway. For upcoming events, visit saratogapreservation.org. If designer Bunny Williams dies and goes to heaven, this is what it will look like. Luxury. 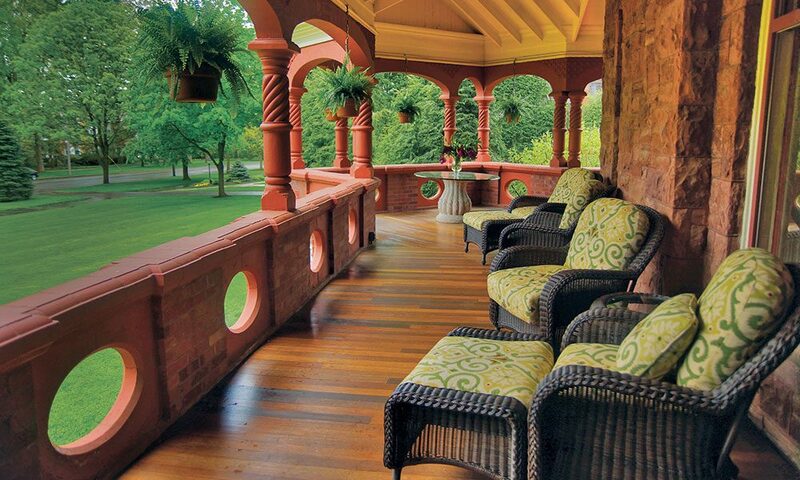 The brick Romanesque-style house was built by lumber mogul Eli Clinton Clark in 1886. When Jay and Alysa Arnold purchased it in 2011, they felt a great responsibility to honor the home’s place in history while still looking to the future. The couple hired Tom Frost of Frost Hurff Architects to design an addition: garage, sunroom, pocket bathroom and Great Room, which perches above the garage. Reclaimed wood and timber were used throughout, and Top Rail Interiors helped design every inch of the rehab and addition. In the original structure, the home has delicate Victorian-era antique furniture, oil paintings of horses and landscapes (including one by George Stubbs) and some contemporary furniture, like a strangely beautiful Foosball table. The new addition was a reminder that even those who seem to have it made, have space challenges. A diminutive bathroom, called “the airplane” bathroom, has vivid but tasteful floral wallpaper, a steam-punk toilet with a chain-link flusher and a custom-made, itty-bitty marble sink. This Second Empire house was built in 1877 and passed through the hands of many loving caretakers, including the Southgates, for whom the home is named. Every object in this home at 688 North Broadway appears to have a fabulous story. In 2005, Tamie and George Ehinger purchased the home and breathed new, vibrant life into it with an extensive rehabilitation. Floors were leveled and wooden molding was refinished to maintain the historical integrity. But their respectful remodeling left plenty of room for modern necessities. They updated the living areas and bedrooms. They put in a gourmet kitchen, with cookbooks and gleaming pots and pans ready for action. Paint and accessories were used to make Southgate feel grounded in the past and ready for the future. The sitting room, which is both formal and comfortable, has deep red walls accented with enormous gold-gilded mirrors and a couch that looks as reassuring as a mother’s hug. In the den, we see a fireplace with pale blue glass tile inset, a scabbard with mother-of-pearl inlay, African masks and vintage board games. The Shingle style home built in 1885 by the Cluett family features a rusticated stone lower story and foundation, varying shingle cladding, tower and porches. Mary Gavin and Jim LaVigne purchased the home in 2000, with a complete rehab in mind. They hired the architect Tom Frost to make interior changes and design a three-car garage. The kitchen was gutted and modernized, structural repairs were made and central air was installed. From the outside, the home looks like an antique doll’s house, with its 100-plus-feet wraparound porch, hanging flowers and lovely wicker furniture. Inside and out, the entire home has a Southern feel and seems to beg for cocktail parties and family barbecues. The 7,800 square feet of living space features a large wine cellar, six bedrooms and two sitting rooms. The art, decor and furniture appear to be selected with comfort, instead of concepts, in mind. Built in 1885, this Queen Anne brick home by architect S. Gifford Slocum has half-timbering detail and was erected for attorney-turned-politico Edgar T. Brackett. As a state senator, he helped establish what is now known as Saratoga Spa State Park. The Senator’s son, Charles Brackett, became a renowned screenwriter and producer. He won three Academy Awards for Lost Weekend and Sunset Boulevard, with Billy Wilder, and for the 1954 film Titanic. The late Harry V. Quadracci purchased the home in 1984 with the goal of restoring it to its original grandeur. The home is currently owned by the company he founded, Quad/Graphics, for the purpose of entertaining clients. The feeling of home so prevalent in other houses on the tour is noticeably absent here. Instead, Brackett House serves as a gorgeously maintained museum. The back courtyard features a brick walkway, gardens and fountains. The woodwork, from the door frames to the dining room ceiling, is stunning in its intricacy and artfulness. The ornate, majestic spiral staircase is the only hanging spiral staircase in Saratoga Springs. All the furniture and antiques are from the Victorian era, except for some artwork. These paintings fearlessly break from the Victorian theme, exploding merrily into post-modernity. In fact, the home is the biggest corporate collection of art outside of a museum. And now for something completely different. This carriage house was built in 1885 and was originally associated with 2, 6 and 10 Clement Avenue in the same Shingle style as the other Cluett homes. For generations, it was used as storage space. In 2007, it was renovated and converted into a residence. The current owners, Betsy and Peter Olmsted, purchased it in 2015. Visitors almost universally gasp upon entering. Words like “fun,” “fearless,” “whimsical” and “cool” burst out of their mouths. Betsy is an artist, and most of her work is hand-painted watercolor textiles depicting vibrant flora and creatures in a strange but inviting world of exaggerated colors.